WhatsClone is simple WhatsApp scanner app thatallows you two whatsApp account to run one device.Install the WebApp for WhatsApp on your android phone and Tabletwithout needing SIM card on phone or tablet. Just scan the barcodeusing your whatsApp to run the same instance of app on anotherdevices. * Use multiple phones and tablet to run same whatsApp* send, download image, video* Play audio* Capture photo or record audio* Sync tablet with mobile phone for whatsApp* Your contacts appear on both devices* download status, stories* youtube popular whatsapp videosNote: If you looking for ad fee version, download from belowlink.https://play.google.com/store/apps/details?id=com.mirrorwa.appDisclaimer: This app make use of whatsApp web's interface to allowusers to utilise their phone as webapp. This app is intended to useyour someone's own whatsapp account on different phone and not tohack any one's whatsapp account. please use app with fullresponsibly and your own risk. The publisher is not associated withWhatsApp Inc.
WhatsClone is simple WhatsApp scanner app thatallows 2 whatsApp account to run one device. Now can use anywhatsApp account on android phone or tablet by just scanning qrcode once.Install the WebApp for WhatsApp on your android phone and Tabletwithout needing SIM card on phone or tablet. Just scan the barcodeusing your whatsApp to run the same instance of app on anotherdevices. * Use multiple phones and tablet to run same whatsApp* send, download image, video* Play audio* Capture photo or record audio* Sync tablet with mobile phone for whatsApp* Your contacts appear on both devices* Very easy to useNote: This is ads free version of the app. If you looking for feeversion, download from below linkhttps://play.google.com/store/apps/details?id=com.mirrorwa.appDisclaimer: This app make use of whatsApp web's interface to allowusers to utilise their phone as webapp. This app is intended to useyour someone's own whatsapp account on different phone and not tohack any one's whatsapp account. please use app with fullresponsibly and your own risk. The publisher is not associated withWhatsApp Inc.
Applore helps keep your phone clean, save memory space, removecache, uninstall bulk apps, improve speed & battery, helpsprotect privacy, update apps, hide/disable apps, move,backup/restore app and lot more!! Must have app for every Androidphones App Management File Management Duplicate finder and removerRAM Cleaner Privacy & Security Junk files finder Uninstallation& Backup Share Apps and files App update notification Insightof your phone File manager Manage your files and folder like you doon desktop. search, copy, cut, paste, delete, move, rename, share,send, file property and more. compress and decompress files searchand share files multiple select, copy, cut and delete files Findfile by category, size, file type Picture and video previewthumbnail. Everyday new files report. Advance file finder AppManager Best tool to find insight of installed and Systemapplications. Find latest, large memory, high cache memory apps anddecide to bulk delete unimportant apps. The bulk uninstallationtool preview used device memory to be freed up space. Apps can bebackup up and restore from google drive cloud, send/share apkfiles, check permissions used by app and hide/disable systemapplications. Junk File cleaner If you device becoming slower,battery draining quickly or device space getting low, this iseffective option to remove junk files, folder and processes frommemory and clean your phone. Assist you to clean cache memory aswell. RAM Cleaner This helps device optimise RAM memory by cleaninggarbage processes and files and make your device much faster forplaying games. The RAM booster will help improve battery life andoverall device performance. App Updates Available The app updatefeature will notify device on availability of new version of anyapplication installed on your device. It will show what's newsection and difference in current version and new version availableon google play store. This helps use upto date applications onphone. Permission & Security The recent study shows that mostof applications on google play store may privately accessing yourdata and considered to be dangerous for your privacy as they stealinformation such as contact, files, device location etc. The apphelp you know about what kind of information each applicationaccessing so you can make best decision weather they should be usedor removed. Duplicate Files Find duplicate files and removemultiple copy to claim device internal memory. We find only exactsame file and display for you. The files coming from various userand group on social apps such as WhatsApp fill device space. Theapp ensure that one copy of file is left by selecting rest of filesfor deletion. Apps Categorisation Are you looking to see what arethe apps are game app or communication apps or health apps orutility apps. This is best tool to find our similar family of appsand make decision to keep apps or remove them. About your Phone Tofind everything about your phone. It will tell you al essentialdevice features like sensors, system on your chips, battery, devicetemperature, camera, network and lot more. Easy, reliable and handy uninstaller tool for your android phone.Free up storage by deleting apps and unused APKfiles.Features:Recycle Bin to reinstall deleted appsApp History forreinstall deleted appsScan memory to remove unused APK filesUserInstalled and System AppsSearch Installed Apps and System AppsSortby Large-small size, name and latest installation time.Multiple orsingle app removal with confirmationSuggest venerability ofappsOpen apps or review any app on play storeNight mode viewDeleteApp in phone memoryUninstall App, Remove apps, DeleteAppsDescription Safe Uninstaller is tool for deletion of unusedapplications to get more space available. It allow multiple appdeletion on single button click.The additional details ofapplication size such as code, cache and data will help you decideon uninstallation. You can also reinstall deleted apps from recyclebin. 'Scan unused apk' will search apk's all over your phone andmemory card. You can choose to delete apk files. Recycle bin willstore all deleted apps for a quicker installation again withoutneed to download from google play. Frequently Asked QuestionsQ: Howto uninstall single or multiple apps?Check the apps that you wantto uninstall and click on uninstall button at bottom. You can alsouninstall individual app by clicking delete icon.Q: Why can't I seeuninstall option on system apps?System apps are pre installed onphone by manufacturer. It can't be uninstalled but you can reducememory by clicking on system app -> Storage -> Clear Data.Q:I see 'Safe Uninstaller' icon on notification bar all the time. Howcan I remove it?You can disabled by unchecking on 'Always Show onNotification Window'Q: Why does uninstalled app goes to Recyclefolder instead of clean uninstall?You have option to backup apkfile to Recycle Bin in order to avoid accidental uninstallation.You can alway enable or disable option from Menu -> Settingsoption.Q: What is 'Scan Unused APK' used for?This option search allthe unused apk files on your file system. You can remove any unusedapk file that you do not wish to store to get more free space.Q:What is night mode?App allow dark graphics for night viewing whichis easier to read for human eyes. Auto option will automaticallyset night mode based on current time.Q: How does Uninstall Historyworks?You can see reference to app uninstalled using thisapplication and respective dates. You can reinstall any app fromapp store directly.Q: Why can't I see some of the app installed onmy phone?You can press on 'Reload Apps' button under menu to loadfresh installed apps. App let you download any Instagram Photoorvideo into your phone's photo gallery.Now you can offline view all your favourite Instagram photosandvideo by downloading to your phone's photo gallery. You canalsorepost any Instagram post and share media with your friends.Theapp is extremely easy to use compare to other apps onstore.Features:√ Insta save multiple pictures and videos√ View downloaded stories and repost them√ Quick Photo and Video viewers√ Auto download photo or video√ Simple yet beautiful Interface√ Grid and List style view√ Notification for easier navigationSteps to use:1. Start Instasave plus app and Open Instagram by tapping on Iconattop.2. Tap “Copy Share Url” of Photos and videos from menu ( under3dots ).3. Click back button or Notification to Go Back.3. Photos/videos will start downloading automatically.Thats it! !Note: The app is intended to help users to download photo andvideosfrom Instagram post however you should refer to Instagramprivacypolicy regarding copyrights of contents. We respect therights ofInstagram. We only use the contents which Instagramallows todevelopers. 'Device Manager' for uninstall, duplicate finder, file manager,clean RAM and more.https://play.google.com/store/apps/details?id=applore.device.managerEasy,reliable and handy device cleaner & uninstaller tool for yourandroid phone. Free up storage by deleting apps, duplicate file,junk data and unused APK files.Features:Clean junk filesRemoveduplicate filesRemove whatsApp received filesRecycle Bin toreinstall deleted appsApp History for reinstall deleted appsScanmemory to remove unused APK filesUser Installed and SystemAppsSearch Installed Apps and System AppsSort by Large-small size,name and latest installation time.Multiple or single app removalwith confirmationSuggest venerability of appsOpen apps or reviewany app on play storeNight mode viewDelete App in phonememoryUninstall App, Remove apps, Delete AppsDescription SafeUninstaller is tool for deletion of unused applications to get morespace available. It allow multiple app deletion on single buttonclick.The additional details of application size such as code,cache and data will help you decide on uninstallation. You can alsoreinstall deleted apps from recycle bin. 'Scan unused apk' willsearch apk's all over your phone and memory card. You can choose todelete apk files. Recycle bin will store all deleted apps for aquicker installation again without need to download from googleplay. Frequently Asked QuestionsQ: How to uninstall single ormultiple apps?Check the apps that you want to uninstall and clickon uninstall button at bottom. You can also uninstall individualapp by clicking delete icon.Q: Why can't I see uninstall option onsystem apps?System apps are pre installed on phone by manufacturer.It can't be uninstalled but you can reduce memory by clicking onsystem app -> Storage -> Clear Data.Q: I see 'SafeUninstaller' icon on notification bar all the time. How can Iremove it?You can disabled by unchecking on 'Always Show onNotification Window'Q: Why does uninstalled app goes to Recyclefolder instead of clean uninstall?You have option to backup apkfile to Recycle Bin in order to avoid accidental uninstallation.You can alway enable or disable option from Menu -> Settingsoption.Q: What is 'Scan Unused APK' used for?This option search allthe unused apk files on your file system. You can remove any unusedapk file that you do not wish to store to get more free space.Q:What is night mode?App allow dark graphics for night viewing whichis easier to read for human eyes. Auto option will automaticallyset night mode based on current time.Q: How does Uninstall Historyworks?You can see reference to app uninstalled using thisapplication and respective dates. You can reinstall any app fromapp store directly.Q: Why can't I see some of the app installed onmy phone?You can press on 'Reload Apps' button under menu to loadfresh installed apps. Features List:* File ManagerManage your files (file explorer) likeyou do on your desktop or laptop using Multiple Select,Cut/Copy/Paste, Move, Create, Delete, Rename, Search, Share, Send,Hide, Create Shortcut, and Bookmark;* Application Manager –categorize, uninstall, backup, and create shortcuts to your apps* 3sets of commercial icons for 80+ different file types, toolbar andmenu items* Multiple resolutions support* Support 19 languages*List and grid view for file explorer* Compress and decompresssupport* Search and share files* Multiple selection and varioussorting support* Thumbnail for photo, video and apk files* Supportfile shortcut on Home screen for easily access* Basic features likecut, copy, delete, compress, extract etc. easily accessible- Workon multiple tabs at same time- SMB(windows) file sharing- Multiplethemes with cool icons- Navigation drawer for quick navigation- AppManager to open, backup, or directly uninstall any app- Quicklyaccess history, access bookmarks or search for any file- Rootexplorer for advanced users- and the list goes on...* Attractivematerial Design UI/UXLight & smoothSimple & cleanMultithemes support* App ManagerBackup appsUnistall appsShare appsPlaystore app link* FTP ServerDownload files and folders from yourphone* Hidden FilesHide any file on you deviceNote:Basic read/writeoperations might not work on external memory on KitKat devices.Don't use cut/paste from or to external SD Card. You might looseyour files.Feedbacks and suggestionsWe’d love to hear from you!Send us your feedbacks via: [email protected]: FileManager, File Explorer, App Manager, FTP Server. Do you hate the multiple steps it takes to just uninstall your apps? Do you sometimes install many apps in order to find one thatsuits your needs, but then you hate the time it takes to uninstallthe rest? Do you need to reset/uninstall apps frequently ? Do youhave a third party launcher and hate the fact that installing appsputs shortcuts on the old launchers? Wanna try getting rid of someof the bloatware your device has (*) ? If so, this is the app foryou ! Features This app has plenty of features, especially forrooted devices: • Easiest uninstaller - single click on an app touninstall it • Batch operations of apps : uninstallation, share,disable/enable, Re-install, manage, open in Play-Store orAmazon-AppStore. • APK files management • Removed Apps historyviewer • Customizable Widgets, for uninstalling the recentlyinstalled app or clearing its internal/external data • Normal/ROOTuninstallation of apps . Using ROOT, it's much easier and faster •Shows all kinds of apps, and not just those that you can launch.For example: widgets, live wallpapers, keyboards, launchers,plugins,... • Auto-handling of apps that have admin privileges,allowing you to revoke them and uninstall the apps • Auto addshortcuts to newly installed apps, no matter how you've installedthem. Also choose exactly which launcher will have the newshortcuts • Various operations on selected app: • Run • Share appas link or APK file • Manage • Open link on play store. • Killbackground processes (available only on old Android versions) •Stop app (needs ROOT+Honeycomb) • Clear internal storage (ROOT) •Create shortcut, including hidden ones • Search the Internet forapp's name/package • Disable/Enable app (ROOT) • Re-install • Sortapps by size, name, package, date installed, date updated, launchtime • OS uninstallation integration • Useful shortcuts to built inapps • Filter apps by: • System/user apps • Enabled/disabled apps •Installation path: SD card / internal storage • Ability touninstall system apps (Root , might not work on some cases) • Showsapp information: package name, date installed, build number,version name • Auto-cleaning of external storage files of apps thatthe OS didn't remove them right for some reason • Theme chooser, incase you don't like the cards UI Best of all, it's free ! ! !Permissions explanations • INSTALL_SHORTCUT - allows the app tocreate apps shortcuts, either manually or automatically (uponinstallation) • KILL_BACKGROUND_PROCESSES - allows the app to killselected apps • READ_EXTERNAL_STORAGE - allows the app to check ifthere is taken space on selected app, in order to allow to reclaimit • WRITE_EXTERNAL_STORAGE - to clear the external storage ofselected app • ACCESS_SUPERUSER - for rooted devices only, allowsmany more cool features, for example background uninstallation •ACCESS_NETWORK_STATE , INTERNET- for ads • BILLING, GET_ACCOUNTS -for donations • GET_PACKAGE_SIZE - for getting apps' sizes• GET_TASKS , PACKAGE_USAGE_STATS - to get recently launchedapps Notes • Uninstallation of system apps is a risky operation. Ido not hold any responsibility in case the functionality of your OSis damaged in any way when using this feature •Some system appscannot be removed due to restrictions enforced by the ROM itself,but the app will try handling it the best it can, and sometimes arestart is needed to see the result • You can remove the ads bydonating as much as you wish • I've worked for a long time on thisapp, and I have plenty of features I have in mind to add to it •Please feel free to rate the app and show your opinion (preferablyvia the forum) on which features you'd like to have for the nextversions. If you liked this app, show you support by rating it,sharing it or donating. Looking for an app to send or share APK of apps with your friendsover Bluetooth? Try this amazing Bluetooth based sharing app -Bluetooth App Sender to share apps with your friends. It is a verysimple to use and smart tool to share your applications with yourfriends. The app also allows you to manage your apps and uninstallundesired apps.On this app, you can view a list of all installedapps on your device along with their details. Details that you canview for the app include the device permissions that the app isusing. With these app manager features, you can also uninstallunwanted apps when you are not using them. The app not only letsyou share the app over Bluetooth, but you can also share these appsthrough email, Facebook or any other social media networks. Appsharing becomes really easy with this Bluetooth APK Sender app.ThisBluetooth Sender app includes amazing features –✓ View allinstalled apps and view details of each app✓ Send any app from yourphone to another phone through Bluetooth, email or other sharingmethods✓ Share apps using Facebook or any other social network✓View app details such as app permissions on your device✓ Uninstallunwanted apps in just one click✓ Run any application from the listto previewAre you ready to experience the power of this smartapplication sharing app to share apps from one device to another?Downloads this app now to get started. It is free touse! ************************SAY HELLO************************We areconstantly working hard on making the “Bluetooth App Sender APKShare” app better and more useful for you. We need your constantsupport to get going. Please feel free to email us for anyqueries/suggestions/problems or if you just want to say hello. Wewould love to hear from you. If you have enjoyed any feature of the“Bluetooth App Sender APK Share” app, do not forget to rate us onplay store. Open everything with this simple and beautiful app Why not give ita try ? ★ Full Featured File Manager (File Explorer) It is a SuperFile Manager which provides all features of file managementincluding cut, copy, delete, rename, compress, extract. You cancheck the file file details, full integrated search within the filesystem. New file and New folders can be created in a second. ★Smart Library File Explorer (File Manager) Categorize all filesinto Downloads from internet, Bluetooth from nearby devices,Images, Pictures, Camera Photos, Videos, Movies, Audio , Music,Documents (pdf, xls, ppt etc), Archives (zip, rar etc) and APK.Easily navigate the library with a single tap. You can alsobookmark all your favourite folders so you can have quick access atany point of time ★ Storage File Manager (File Explorer) Access allfiles and folder from different types of storages like EMMC, MMCcars, SD Cards, Internal Storage, External Storage , Phone Memory,USB Storage, Flash Drive, Pen Drives, USB OTG (Nexus and Non nexus)with support for FAT file system ★ Root File Manager (FileExplorer) for advanced users to explore, edit, copy, paste anddelete files in the root partition of phone storage for developmentpurposes. Explore root folders of the system like data, cache. Youphone needs to be rooted to use this feature ★ App Manager andProcess Manager Free memory by killing tasks and speed up yourphone instantly. Quickly and easily uninstall multiple unwantedapplications and free up phone storage space which is veryvaluable. App Manager helps you save your favorite apps on tomemory and install them back again when needed ★ Network ManagerTransfer files with FTP Server from phone to PC. All you have to dois open the IP address in browser and all your files on the phoneare easily accessible. You can also share files from your phoneusing bluetooth, wifi direct other social networking apps etc ★Document Editor you can easily edit files on the go. Support forevery type of text files. Very simple and handy. App Manager makes it so easy and straightforward to manage yourinstalled Apps and APK files in phone storage, all within twotaps.Major features include:◆ App Uninstall - Group installed userapps and system app updates in specific order (name, install timeand size). 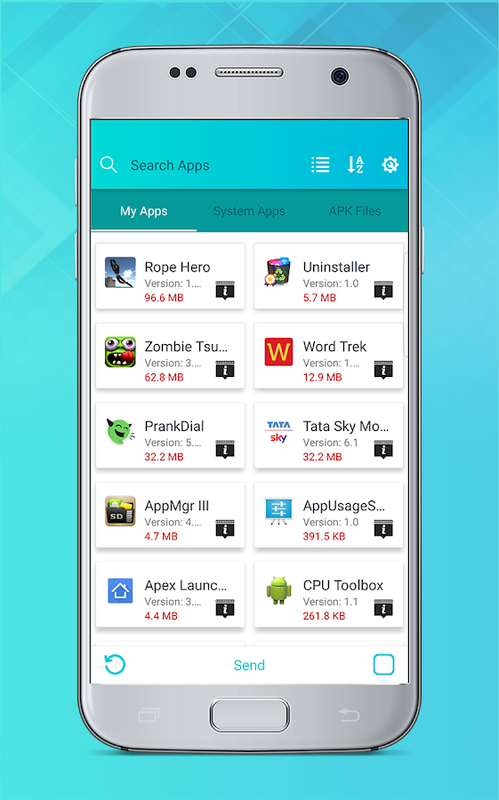 Display detailed information about each app before youdecide to uninstall it.◆ App Backup - Backup your important App asAPK files in your storage for future restore.◆ APK install - HaveAPK files in your phone storage? Want to know whether it's beeninstalled or just redundant file? App Manager is able to presentyou with accurate details.◆ App Move - Group apps that can be movedto SD card.If you like this App Manager tool and would also want tocatch latest product update and news, please follow developer'ssocial media account:♥ Twitter: https://twitter.com/saquer0716♥Google+: https://plus.google.com/100162374001113169687Suggestionsor thoughts about App Manager are more than welcome, please leavereview in Google Play or contact me directly [email protected] I can guarantee that every single feedbackwill be replied. The best way to find new apps in Google Play (Android market). Makethe Android market usable, and find your next favorite app, livewallpaper or widget: - App recommendations - New and hot apps ofthe day - Find top Android apps with a price drop - Share your bestapps (eg twitter/facebook) - Tracks market update: notifies ofupdates available - Fast uninstaller - Browse "my apps" onwww.appbrain.com and install apps with a sync instead of barcodescanner - Keep your list of installed apps as a backup onAppBrain.com AppBrain is the best way to discover top Android appsin the Android market and to manage your apps. The recommended appshelper provides recommendations based on what you already use. Wealso have recommended games. It does not work with the Amazon appstore. The manage apps is like a killer file explorer / taskmanager for your already installed apps: - Start app, Quickuninstaller, share to Facebook - Fast sync widget to accessAppBrain from the desktop and backup your apps to the cloud -app2sd functionality to move apps to sd (app 2 sd) - Find marketupdate: notifies you of any updates available Discover cool appsand top games in the Android market: - sort by hot apps today, hotapps this week, highest rated apps, price drops etc - Filter appsby free apps, paid apps, price reduced apps, app2sd enabled apps,new apps - Fast search over the entire Android market - Unlikeapplanet or black market, these are only legal apps. AppBrain isthe best app market and app discovery tool for Android apps fromthe Android Market. It allows you to easily find the best apps inthe Market, the free apps and downloads, the price drops, livewallpaper, widgets and much more. *** NOTE: This app not a pixel navigation so if your device hadsystem navigation. Kindly don't use this app *** Utilities:1. Norequire ROOT 2. Custom Animation3. Custom app blacklist4. Doubleclick, long click, ontouch feature to do something5. Custombackground color6. More style to use7. Custom auto hide navigationbar8. Resize navigation9. Resize swipe area10. Very easy to use***Require: Android Version >=21 LolipopYou can use it and give mefeedback. I will improve this app. Please kindly rate this app ifyou feel it useful. Thank you and have a nice day.Tag: NavigationbarHome buttonBack buttonRecent buttonButton saviorBroken button*This app uses the Device Administrator permission.It is necessaryand used only for locking the device when you use feature turn offthe screen. You need to enable Administration before it can be usedthat feature. To uninstall the app, please open my app and clickthe "Uninstall" button. * This app uses Accessibility servicesWerequest this permission to:+ Receive notifications when you areinteracting with an app to make color auto change and some feature+Inspect the content of a window you are interacting with. To enablesome feature like back, recent press, etc.# note 8 navigation bar,s8 navigation bar, button savior, broken buttonPlease be assuredthat we will not collect any personal information. It turns automatically the screen off when you put your phone intoyour pocket or onto a table. And turns the screen on when you takeit out or up. No need to touch any button and you are ready to go.It's especially helpful if your lock key is hard to reach or thepower button is broken. The most popular screen on/off app.Reviewed by LifeHacker, MakeUseOf, TheNextWeb, Gizmodo and manyothers ... WARNING:If the app is killed by the OS after some timevisit: https://dontkillmyapp.com/ KEY FEATURES • Pocket Sensor:Turns the screen off if your phone is in your pocket. • TableSensor: Detects your phone is lying on a table and turn it off ifnot in use. • Turn Screen On by Motion: If the screen is off andit's facing up the device can be woken up by moving it. • KeepScreen On by Motion - Rise to Wake: It keeps the screen on whileyou are watching the screen. It relies on the small movements ofyour hand while holding the device. • Smart Lock support: It's aworkaround to make the Smart lock feature work fine on devices withLollipop. • Locale plug-in for: Tasker, Llama and others UNLOCKEDby IN-APP PURCHASE • Better performance • Widgets, Shortcuts •Wider range for Rise to Wake Timeout • Wider range for Table Sensor• Suspend in Landscape mode • Exclude Apps option BATTERY USAGE Itshould be not significant. I experienced about 6 per cent extraconsumption on the test device. However it can be much higher byoften using the Rise to Wake feature. Thus, keep your phone facedown if you want to save energy. UNINSTALL Please, use theUninstall button in the app. Due to Android restriction the appcannot be uninstalled on a normal way. FAQ: http://goo.gl/D4BgQ5This app uses the Device Administrator permission. This app usesAccessibility services.